An educational Venturi tube that allows students to study the Venturi meter and Bernoulli’s Theorem and to make direct comparisons between the results obtained by experimentation and those predicted by theory. TecQuipment’s Bernoulli’s Theorem is typical of meters used throughout industry. However, it has many more pressure tappings, connecting to water manometers, which allow full study of the pressure distribution along the convergent-divergent passage. 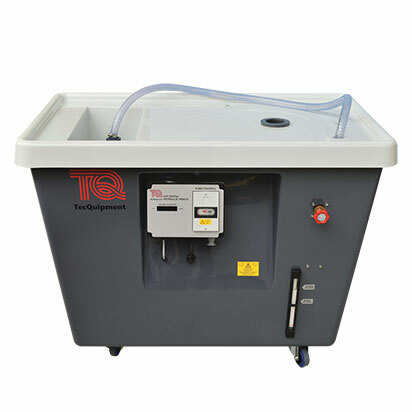 The Benoulli’s Theorem apparatus works with TecQuipment’s Digital Hydraulic Bench (H1F, available separately)* and stands on the hydraulic bench worktop. The benches measure flow rate, so students can find the Venturi meter coefficients over a range of flow conditions. The apparatus includes a horizontal Venturi tube, a downstream flow-control valve and manometer tubes. A manometer panel holds the manometer tubes vertically. A common manifold above the tubes has an air pressure-control valve. The base has adjustable feet. 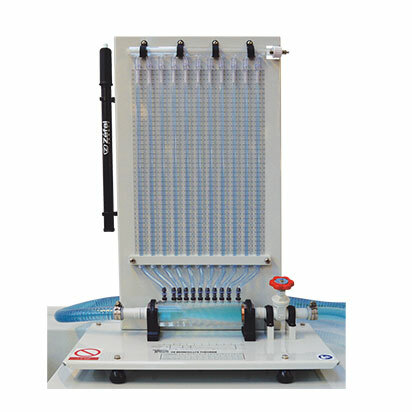 The manometer panel has a scale behind the manometer tubes for direct reading of the water levels in the tubes. Plastic materials and corrosion-resistant finishes throughout the equipment protect against corrosion. Water enters the Venturi meter and its flow-control valve sets the flow rate. This valve is downstream, so it does not cause any upstream turbulence. To adjust the datum water level in the manometer tubes, students connect a hand-pump (included) to the air valve above the manometer tubes. To perform experiments, students set and measure the flow rate through the Venturi. They measure the head at the cross-sectional area at the upstream section, and the head at the throat section. They also note the pressure distribution along the rest of the meter. They then repeat the procedure, reducing the flow rate in increments and taking similar readings each time. Students can compare ideal pressure distribution to measured pressure distribution and calculate the coefficients of discharge for the meter.